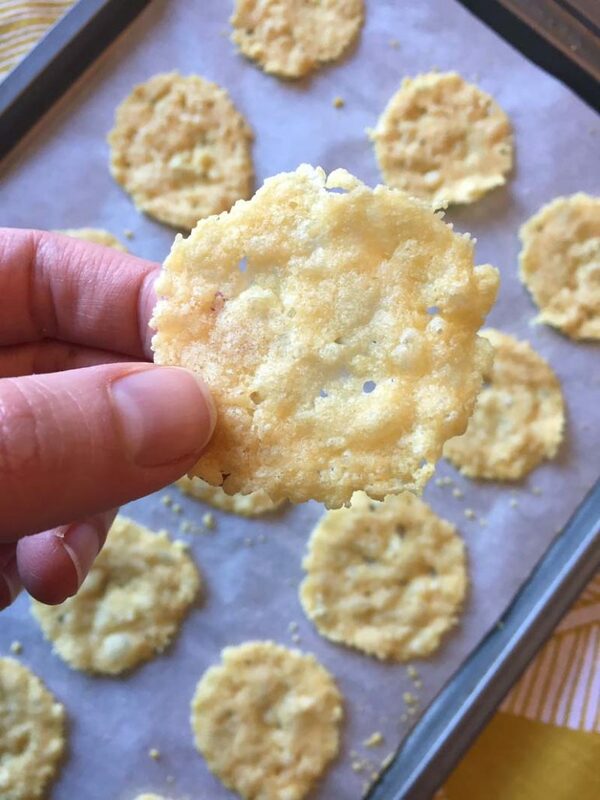 Crunchy and flavorful, these Keto Parmesan crisps are full of flavor and so incredible. I love any excuse to enjoy parmesan cheese and this recipe is beyond amazing. Do you love a little crunch on your salad? What about a delicious chip? If you miss crunchy croutons or potato chips on a Keto diet, these crisps are perfect for you. They add a delicious crunch to any meal. And the flavor?! Well, the crunch is great but the taste is out of this world. 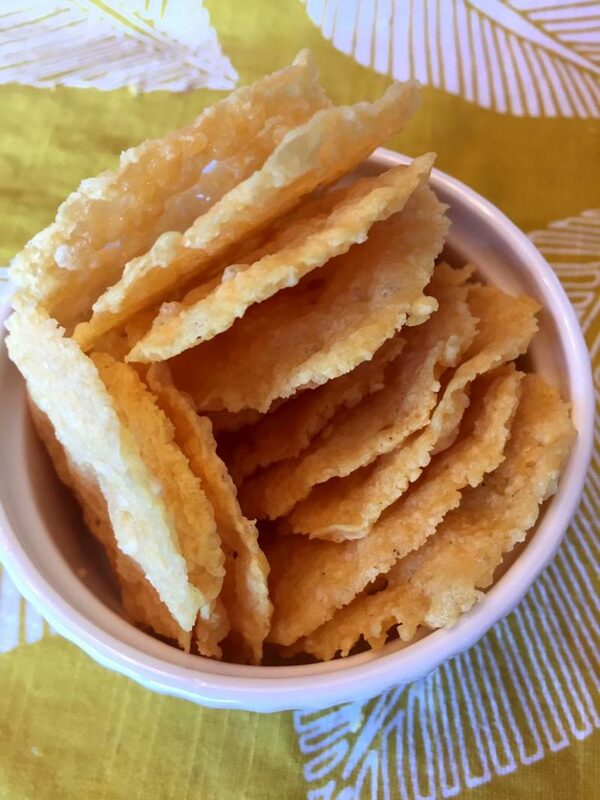 Low in carbs, this recipe for Keto Parmesan Crisps is so easy and uses only one ingredient! Yes, a single ingredient! 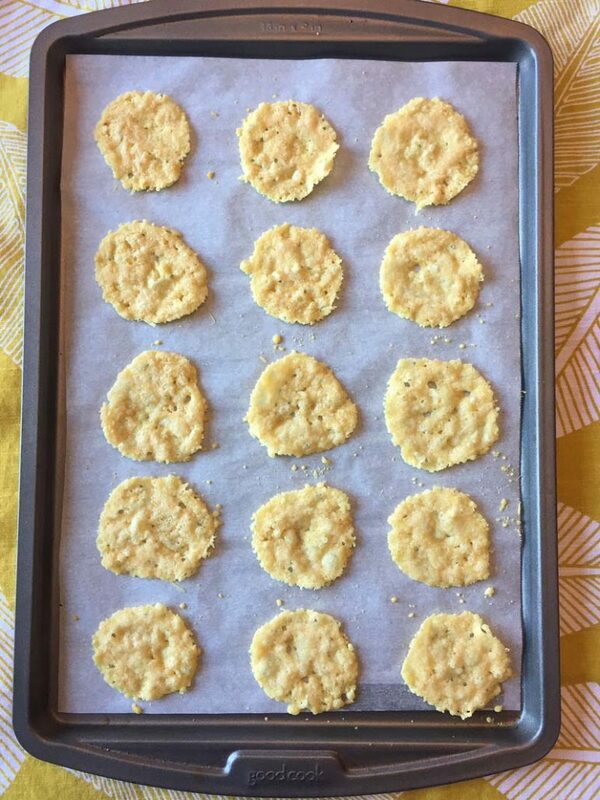 Even better, these parmesan crisps take only ten minutes to make. 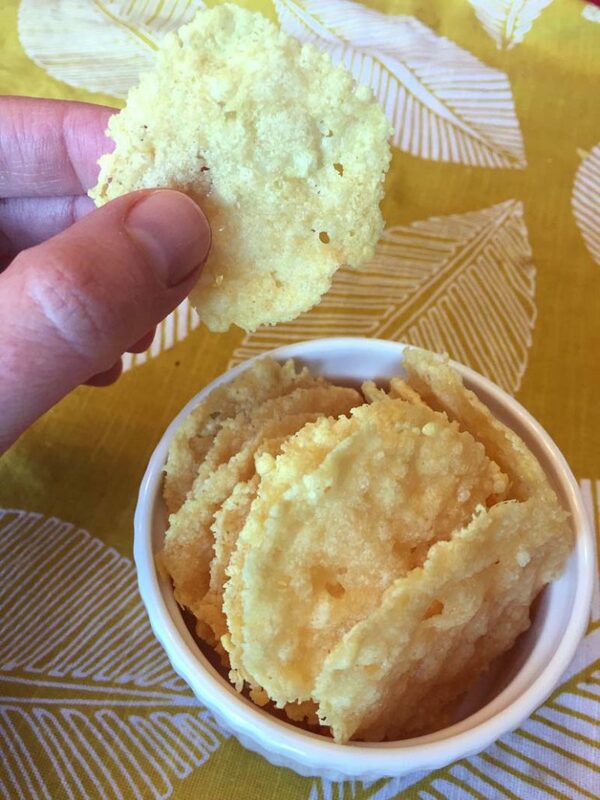 So easy and delicious, you will make these addicting little crisps over and over again. 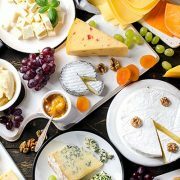 You can’t go wrong with parmesan cheese, so be prepared for some delicious, cheesy goodness with this recipe. To make this delightful crisps, all you have to do is drop Parmesan cheese on a baking sheet lined with parchment by a tablespoon. Flatten the little piles to make circles. If you want realty perfect crisps, you can even use a biscuit cutter to keep the circles neat! Next, put the baking sheets in the oven for five minutes at four hundred degrees. 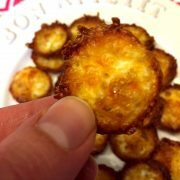 When your cheese is fully melted and bubbly, you’ll know your Keto Parmesan Crisps are done baking. Remove the crisps from the oven and then them cool on a baking sheet for five minutes. Once cool, your crisps are ready to enjoy! You can store the crisps at room temperature for up to three days so you can enjoy them day after day. 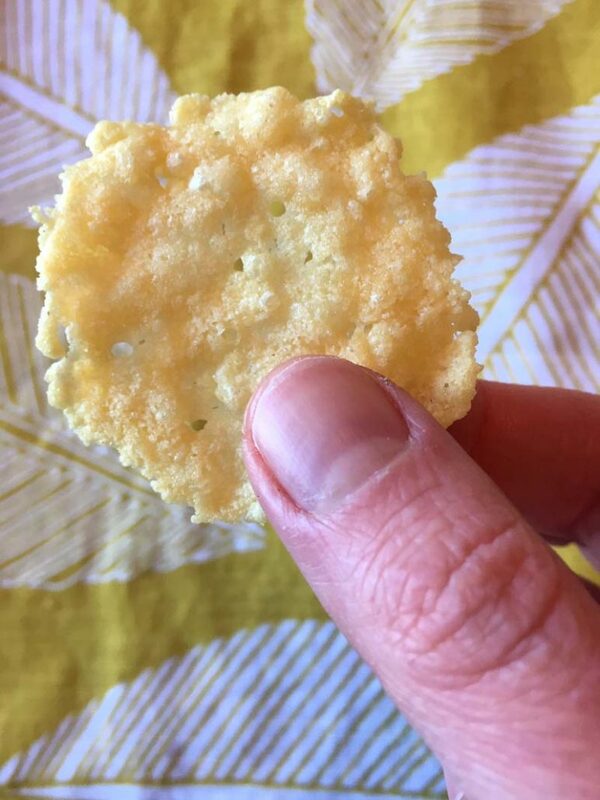 When I first tried these Keto Parmesan Crisps, I could not believe how crunchy and delicious they were while also being low in carbs. They are so yummy that I just can’t get enough. You will love the crunch these crisps provide as much as that delicious parmesan flavor. 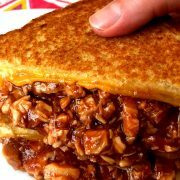 With the texture and flavor combination this recipe provides, you will make them again and again. Low-carb doesn’t mean you have to give up on that crispy crunch provided by chips. These Keto Parmesan Chips are, dare I say it, better than potato chips without all the carbs. Give them a try and you will see just how amazing these crisps are! 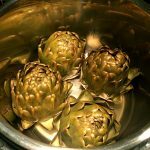 Taking only minutes to make, you will come back to this recipe again and again! Cheddar Keto Chips – another awesome cheesy Keto chips, these ones are made with Cheddar! Must-make for cheese lovers! 90 Second Keto Bread – this single-serving keto bread is cooked in a microwave in a mug! Tastes like real bread, so good! Keto Coconut Chicken – these chicken tenders are breaded in coconut flakes instead of bread crumbs! So crispy and delicious! Parmesan Pesto Chicken – chicken is slathered in pesto and sprinkled with Parmesan cheese, then baked. 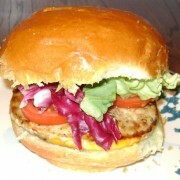 Mouthwatering! 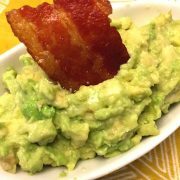 Keto Bacon Chips – another keto chips recipe, this one is made with crispy bacon! Bacon lovers will love these chips! 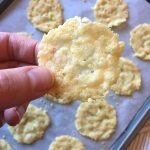 These keto Parmesan crisps are amazing! 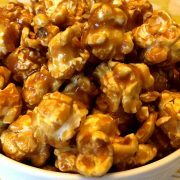 So crunchy, it's hard to believe they are low-carb! You just can't go wrong with Parmesan! Put baking sheets in the oven and bake for 5 minutes, or until the cheese is fully melted and bubbly. 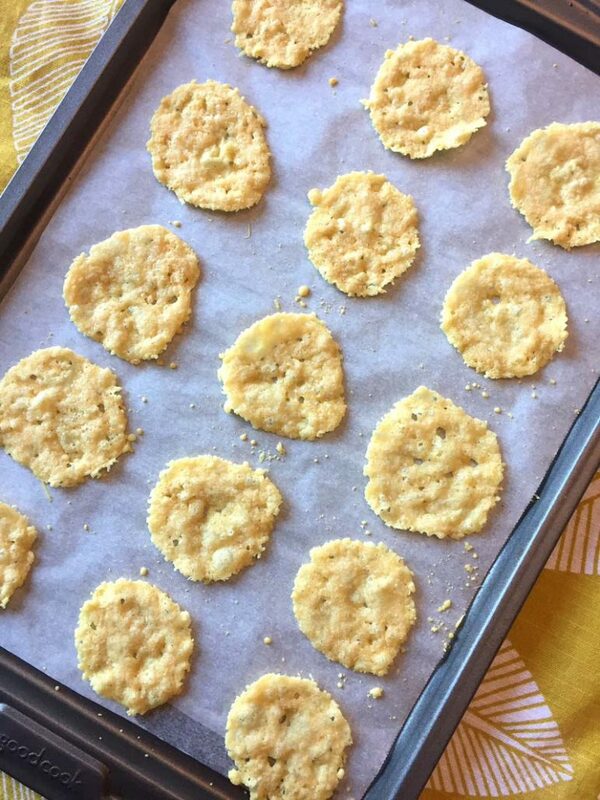 Remove Parmesan crisps from the oven and let cool on a baking sheet for 5 minutes. 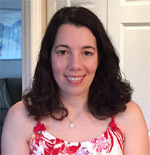 Parmesan crisps can be stored at room temperature for up to 3 days. 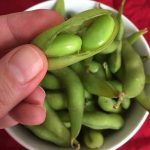 2 Ingredient Keto Chips - Low Carb, Gluten-Free and So Crunchy!